“Martin Jones just lost his liquor license,” Mike Lange emphatically exclaimed on the Penguins Radio Network on Nick Bonino’s game-winning goal with less than three minutes left in the third period. 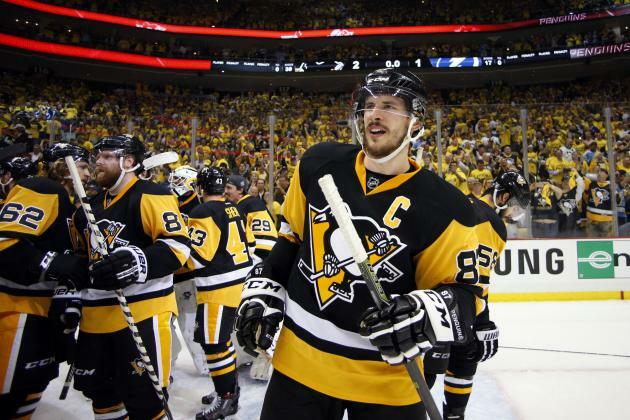 The Pittsburgh Penguins picked up where they left off in game six and seven against Tampa Bay in the Eastern Conference Finals, dominating shots on goal and puck possession against the San Jose Sharks. The Penguins outshot the Sharks 41-26 in game one, as Patric Hornqvist and Bonino led the Penguins with six shots. Matt Murray made his 15th career postseason start, two more than he made in the regular season, and he came up big when the Penguins needed him. Murray made multiple breakaway saves against Nick Spaling and Joe Thornton, saving the game for the Penguins. The ice was tilted opposite the Penguins’ bench, as all five goals were scored in that goal. The first period Pittsburgh Penguins looked unbeatable, outshooting the Sharks 15-4, but those Penguins remained dormant until late in the third period. The Sharks exercised their nerves of playing in the franchise’s first-ever Stanley Cup Final by giving the Penguins a dose of their own medicine. San Jose outshot the Penguins 13-8 in the second period, and evened the scoring at two. Earlier Monday afternoon, I had Mark Purdy, columnist for the San Jose Mercury News, and Alan Saunders, Pirates beat writer for the Associated Press, join my radio show to discuss the series. Purdy said the Sharks have the better defensemen corps, from top to bottom, because of their depth, but it did not show, as the Penguins put 41 shots on goal. Saunders said a player to watch for the Penguins was rookie Bryan Rust, and Rust lived up to Saunders’ prediction, scoring the first goal in this Stanley Cup Final. Coming into this game, the Penguins were expected to struggle with the physicality of the Sharks, which was evident in the second period, as San Jose imposed their offensive and defensive will for much of the period. But it seems the media somewhat underestimated the speed of the Pittsburgh Penguins, which seemed to be the difference in tonight’s contest. However, the Sharks were able to cause some frustration amongst the Penguins with their active sticks in passing lanes, disrupting multiple breakaways and odd-man rushes going toward Martin Jones. As this series continues, both teams are going to need to impose their game on the other team. The team that can maintain their game longer and more effectively in the offensive zone will win this series. Like Caleb On Sports on Facebook and follow on Twitter @CalebOnSports!